A good first impression happens within the first 5 seconds. What is true in face-to-face business carries through to the Internet. Customers increasingly find their vendors, suppliers, and resources through the Internet. Your website either invites customers in the front door or turns them away with just a click of a mouse. Well designed websites allow businesses of all sizes to compete on a level playing field. In an ever increasing global economy, where products and services are delivered via digital format and through ecommerce web design solutions, customers can be around the block or around the world. A company's website is a prospecting tool, a virtual storefront, a sales staff, and a means of staying in contact with your clients. Therefore, presenting your customers, clients, and stakeholders with a comprehensive website which is both visually appealing, and simple to navigate has become an essential part of connecting with your market. In real estate success is determined by location-location-location. In the digital real estate market, success is determined by content-content-content. Your website visitors expect to receive valuable In formation from your business before they will make a buying decision. Information such as industry trends, reviews from satisfied clients, and examples of your work will demonstrate to your website visitors that you are a reputable company poised to serve their needs. The essentials of an affected website include content, navigation, and graphic presentation, integrated it with the e-commerce web design when needed. These three essentials must be integrated with your company's logo design.These three essentials remain unchanged regardless of the company. Connecting these three website design essentials with the culture and personality of your business is the key in building a successful website which sets your company apart from the crowd. Fortune 500 companies such as UPS, Wal-Mart, or Sony have websites which look and feel much differently than an avantegard poet, or weekend garage band. Yet if the site is to be successful, it must use these three design essential elements to connect their website visitors the heart and soul of the company. Our web designers and web project managers will spend time in your business to identify and determine the look, feel, content, and graphic representation which most effectively connect your business with your customers. Although true in the movie Field of Dreams, the Internet offers no such guarantee. Even the most comprehensive website will be ineffective if customers can't find you. Your website must be coded properly with keywords which reflect your businesses priorities. 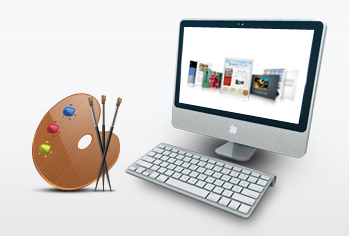 Your websites of graphic design should be integrated with your company's logo design. Your website must be promoted to popular search engines and receive attention from key-word advertising campaigns. The world has changed. No longer can a business hang a shingle outside his door, whether on Main Street or in the digital Mainstream, and expect customers to wander in. A successful web presence is the product of a well-designed site connected to an integrated marketing campaign. Let Slogx web design company develop a marketing campaign for your business and your Internet presence so that your investment returns real profit.